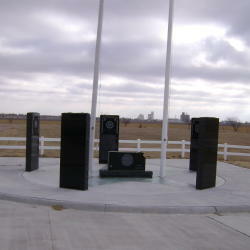 Description: Five polished black granite slabs surround a central marker and paired flagpoles. These markers are identified with each branch of the service (Army, Navy, Air Force, Marines, and Coast Guard) and list names. The center marker is in the shape of the state of Kansas. One side is engraved: "(Kansas seal) ~ Never Forgotten". The reverse is inscribed: "Veterans Of Foreign Wars ~ Of The ~ United States ~ by the authority of the Veterans of Foreign Wars of the United States: ~ Be It Known, that Comrades ~ (names) ~ having served honorably in the Army, Navy or Marine Corps of the United States of America in foreign wars of the United States of America, are hereby authorized to organize and are constituted a Post in the ~ City of Johnson in the State of Kansas to be known as Dust Bowl Post No. 3684."